This past November, the lack of consensus in the European Council resulted in the rejection of the European directive that would have made it imperative to have 40% women in the non-executive boards of publicly traded companies. Commissioner Viviane Reding had spent over two years advocating this measure, which had already been approved by the European Parliament and the European Commission last year. In addition to the obvious restrictions on free enterprise, some insisted that imposing measures leads to compliance (“comply and lie“) rather than convincing. Imposing underestimates and undermines the arguments of business needed to get to the root of the problem and convince companies to change the corporate culture in a way that allows women to join management committees and boards of directors, and ultimately generate more business. In my opinion, that is the natural way to promote the advancement of women in the business hierarchy. First, we must redefine the problem by exploring its causes, since quotas only bring about minimum compliance, drawing on a philosophy based on egalitarianism (as opposed to equal opportunity), rigidity (instead of flexibility) and indicators. Experience shows that quotas are ineffective. One particularly revealing fact (given its transcendence) is the birth rate in the different countries in relation to the percentage of women in executive roles and on boards of directors, adding the variable of the existence or nonexistence of policies on work-family balance: atop the European ranking in birth rate are Great Britain, Ireland and France (the only three European countries with the minimum birth rate deemed necessary for generational replacement!). “Coincidentally” neither Ireland or Great Britain have quotas, yet both have over 20% female executives . France, which has 30% female executives, is the benchmark country when it comes to family-related policies. The fact is that oftentimes, effects are mistaken for causes and action is taken to improve indicators (i.e., few women on boards) without resolving the underlying problems. As a result, instead of solving the problem, we mask it even further. Currently, women in middle-level management positions tend to stagnate or leave the job market due to the lack of work-family measures and flexibility at companies. The term glass ceiling means management styles and cultures that hinder that balance: long workdays, poor access to information and a male-dominated network of contacts, not to mention the limited support in the maintaining the household. The term concrete ceiling comes from a change in female ambition (conscious or unconscious) following maternity, when women want to have a balance between work and family and it seems unfeasible. There are already some good measures to prevent this, implemented in some companies and legislations, which put an emphasis on the differences between men and women, and equal opportunities in recruitment, training, promotion and remuneration, as well as helping with senior mentors for career coaching. In light of all this, we must take steps in the right direction, by identifying the reasons for the lack of equal opportunity between men and women in the existing systems, updating management styles and, if necessary, reshaping business values. That would certainly elicit a commitment and allow for talents to be maximized. The philosophy underlying this strategy is diversity (each person is unique and unrepeatable with changing skills and needs), flexibility (synonymous with life) and sustainability (creating institutions with value). From this perspective, the benefits of having women present in the enterprise and on boards of directors are quite positive for business : increased productivity, efficiency, innovation, and more proximity to the vision of the customers by reflecting the true composition of the market. A new paradigm is possible, not with quotas but with business-driven arguments instead. How do you see it? 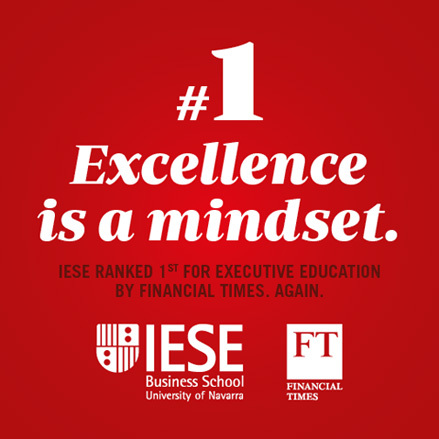 At IESE, our commitment to disseminating these ideas and fostering training materializes through various initiatives. One current example is the program focusing on “Women on boards”. Other activities promoting training and networking include the long-standing meetings of the women’s lobby, which are now part of IWILL (IESE Women International Leadership Lounge), a global platform of female executives.